TORONTO, May 12, 2015 /CNW/ – It’s the first long weekend of summer. There is only one thing standing between Ontarians and a weekend by the lake: the long weekend traffic. According to a survey on distracted driving commissioned by ingenie, an auto insurance brand designed for drivers aged 16 to 24, many young drivers in Ontario admit they don’t always give the road their full attention. The research revealed several ways drivers get distracted, from playing D.J. for an excited group of passengers, to texting an update on their expected arrival time. Delegate some duties to the passenger who’s riding shot-gun: The majority of young drivers (54%) use their phones for directions while they’re driving. “You’re better off enlisting your passengers to act as navigators so you can focus on the road,” says Phair. Put your phone out of sight (and out of mind): Only one quarter (23%) of young drivers put their phone out of sight when driving. The majority (60%) say they keep it on the passenger’s seat or the cup holder. “It’s much easier to get distracted by your phone if you can see the alerts popping up,” says Phair. She recommends that drivers put their phones on silent and out of sight when driving. “If you want to use your phone for music, you can put it on airplane mode so other alerts don’t come through and distract you,” she adds. 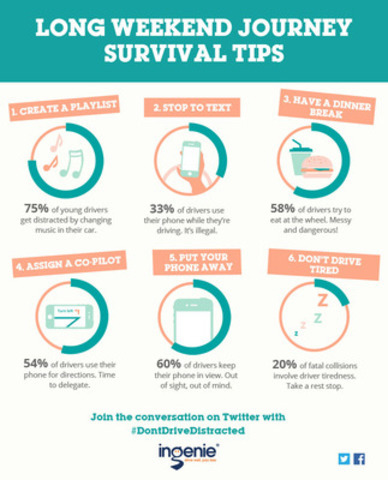 Two-thirds of young drivers surveyed said being involved in a crash would be the top deterrent to distracted driving. Drivers who sign up with ingenie install a Smartbox, a small self-contained unit, which collects data on driving behaviour such as speed, acceleration, braking and cornering. After beginning to drive with the Smartbox, customers get feedback every ten days through an ingenie app on their smartphone or online. The feedback includes a driving score out of 100, tips on how they can improve and an update on how much they stand to save for their safe driving. Compared to traditional insurance models where drivers would have to wait until the end of the year to see a discount, young drivers with ingenie can earn their Good Driving Discount three times a year – up to 25% off over the year in total. In the U.K. where ingenie has been available since 2011, the approach has reduced young drivers’ risk of having an accident during the first six-months of driving by 40%. Seventy per cent of ingenie’s U.K. drivers earn discounts for safe driving. For more information on how ingenie works visit www.ingenie.ca. As Ontarians gear up for the first long weekend drive of the summer, follow the conversation about distracted driving online using the hashtag #DontDriveDistracted. ingenie is an innovative young driver insurance brand that uses telematics technology to reward safe driving with savings. ingenie builds a picture of a driver’s individual style, awareness and safety on the road, rewarding those who drive well with up to an extra 25% Good Driving Discount and helping those who need improvement become safer. ingenie was awarded the prestigious Prince Michael International Road Safety Award in 2013, in recognition of its work to help make young drivers safer on the road. Among a number of industry awards, ingenie has won best start-up at the 2014 British Insurance Awards and insurance innovation of the year at the Insurance Times Awards. Results are based on an online survey conducted for ingenie by Student Life Network between April 17th & April 21st, 2015. A total of 600 interviews were collected from Ontario students who are licensed drivers.